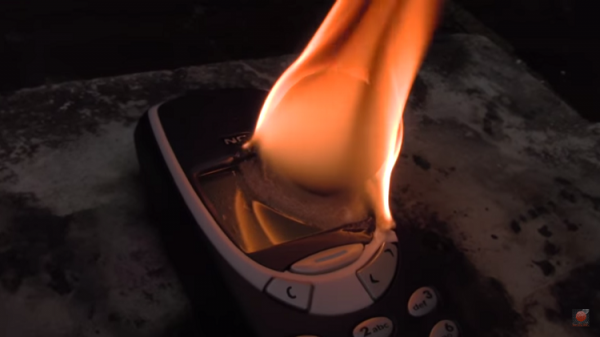 The Nokia 3310 has a reputation for being nearly indestructible; because of this, one must go to absurd lengths to attempt to destroy the legendary phone. Youtube channel carsandwater understands this, and demonstrates just what happens when a Nokia 3310 meets a red hot ball of nickel. The video does not offer any indication of how hot the nickel ball is when it first makes contact with the Nokia device; but considering that the melting point of nickel happens to be 1,455°C, it is safe to assume that nobody should be picking it up with their hands. However, despite the heat, the ball doesn’t do more than ignite the plastic shell and melt the display. A testament to the construction of the Nokia 3310, and what is assumed to be a steel chassis on the inside. This video isn’t particularly informative, but it is incredibly entertaining. Just remember to turn up the volume to hear the fire crackling as it burns through the phone’s outer layer.